Ok so I meant for the book review post to be for today and this post to be for yesterday, but what can you do? Sometimes you lose track of dates and things come up. Like a stomach virus from h-e-double hockey sticks. Thankfully it wasn't me that had the virus...just Michael. Poor thing he has been out of work all week and as much as I love him, I think I'm ready for him to go back. We had 4 straight days of vomiting and other loveliness (including the dog...sympathy sickness I suppose). Let's just say I'm not a very good caretaker. It's not my thing. When I'm sick I just want someone to bring me my meds and then leave me alone to deal with it. Michael wants babying. I don't do babying. It took him 2 hours to eat 1 cracker...2 HOURS!!!! 6 hours to drink half a Gatorade. This was while we were trying to cure his severe dehydration. It was torture (and a learning process) - for both of us. Anyways, all is back to normal now. Everyone survived and it's time to get back to business as usual. Monday was Michael's birthday...which we only slightly celebrated due to the virus. We had actually gone back to our old condo over the weekend and then got stuck there for the rest of the week which left me with no fun birthday stuff to do for him! 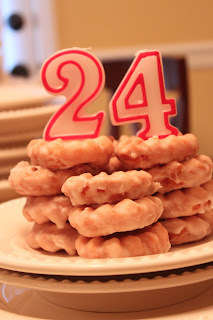 I did manage to make him a birthday cake out of Krispy Kreme Crullers though. So this weekend we are going to really celebrate. Dinner out with the in-laws and my dad, yummy mini raspberry cheescakes for the birthday boy, and maybe a little shopping. Maybe I can make up for my terrible caretaking skills! I am with you! I am not a caretaker, and when I am sick I just want someone to bring me food and leave! Hope you have a good weekend! My boyfriend wants babying too! It wears me out - he gets this pouty voice and everything!! haha that sounds so terrible, I do take care of him I promise. I'm just like you though, give me my meds and leave me alone. Oh, and don't try to tell me to stay in bed because it's not going to work!